I was greeted by a familiar sound from shows past when I went into the first MoFi Distribution room on the Renaissance’s third floor: a track from the All Star Percussion Ensemble LP that showed off the superb imaging and terrific transient reproduction of the Manger P2 speakers ($18,995/pair; $21,995/pair in the Rio Palisander veneer being demmed). Using a bending-wave transducer to cover everything from the lower midrange upward, supported below 340Hz by an 8″ woofer with a carbon-fiber cone, the P2s sounded perhaps a bit too sweet in the top octaves when the percussion cut was followed by Vivaldi’s Four Seasons. The LPs were being played on a Dr. Feickert Firebird turntable ($14,995) with an Origin Live Illustrious 12″ tonearm ($2000) fitted with a Koetsu Rosewood Signature cartridge ($7495). 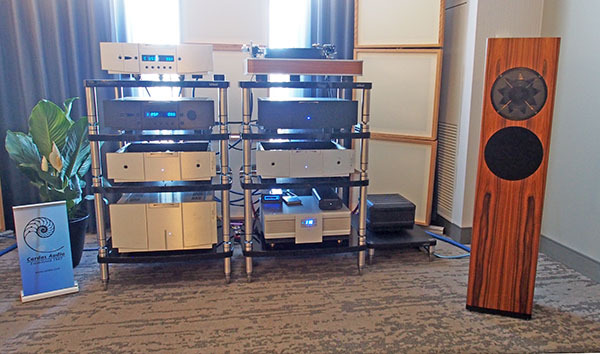 Amplification was all Balanced Audio Technology: VKP-12SE tubed phono preamp ($9995), REX II tubed preamplifier ($24,995), and VK-65SSE solid-state power amp ($16,495). Power conditioning and power cords were by Isotek, stands were from Solidsteel, and all the signal cables were Cardas Clear Beyond. An undoubtedly expensive system but certainly a musically satisfying one.